Saint Petroc Monastery, Hobart, Tasmania. A ROCOR missionary initiative. “St. Petroc Monastery was started in 1992 after Fr. Michael arrived in Tasmania from England, it is within the jurisdiction of Archbishop Hilarion, Archbishop of the Russian Orthodox Church Outside of Russia, Diocese of Australia and New Zealand. “…being presently in a leased building which belongs to an unrelated secular organisation…”. The RAAF Veterans' Residences Trust was established by a Commonwealth Act on 12 December 1953 for the purpose of providing residences for former members of the Air Force and their families who are in necessitous circumstances. Another of the St. Petroc Monastery websites includes a brief reference to the monastery’s objectives. “The primary task assigned by the Archbishop to Saint Petroc Monastery is to identify and implement the means of bringing the Anglo-Saxon-Celtic people (the overwhelming percentage of the population) to return to the Orthodox heritage of the British Isles and western Europe. For this task, Saint Petroc Monastery, its people and parishes are blessed to the Western Rite. Saint Petroc Monastery is incorporated under the Associations Incorporation Act as a non-profit organisation. The South Hobart flat appears to be the “flagship” site for SPM and. With two exceptions missions listed as being “affiliated” have no street addresses . “St Dyfan, 40 Alexander St” is the “faith centre” at the University of Tasmania where Fr. Michael has unpaid visiting rights. A website provides a listing and some details. Saturday Vespers and Sunday Liturgy at the above chapel. The Orthodoxwiki website contains the following basic information about the monastery(as at 30th October 2006). It appears that most material has been provided by SPM. “Saint Petroc Monastery is a semi-eremitic monastic community for men in the Russian Orthodox Church Outside Russia located in Cascades, Tasmania. The current superior is Hieromonk Michael, and follows the Sarum practise of the Western Rite. The Monastery consists of two affiliated houses: Saint Petroc House, with a small chapel, at Cascades; and Holyrood House, with a small chapel, at Avondale. Saint Petroc Monastery was founded in 1992 as an Anglo-Catholic monastery. In 1995 it turned to Orthodoxy and, under instruction, was placed under the direction of Patriarch Ignatius IV of Antioch. In 1997, the monastery was received into ROCOR, under the omophorion of Archbishop Hilarion of Sydney, Australia and New Zealand, with the mandate to not only continue using the Sarum practise of the Western Rite, but to do so with the explicit intent of attracting people of Anglo-Celtic ancestry to Orthodoxy through this rite. The Monastery also received permission to create attached monastery missions and parishes. In 1998, the monastery began one of these attached missions in Launceston, named for St Stephen. In the same year, Fr Michael becomes a chaplain at the University of Tasmania. ROCOR received both Michael Wood and Barry Jefferies in 1997. However I have had little success in researching Barry Jefferies’ background, and in any case his role in this initiative appears to be a passive and subordinate one. 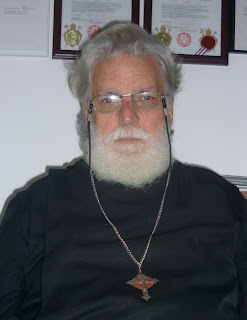 “Father Michael is a Hieromonk (Priest-monk) of the Russian Orthodox Church Outside of Russia. He came to Tasmania from England in 1991 and was appointed as the Orthodox Chaplain to the University in 1998. His main office is in the Chaplaincy Centre and he is therefore on campus most days of the week. 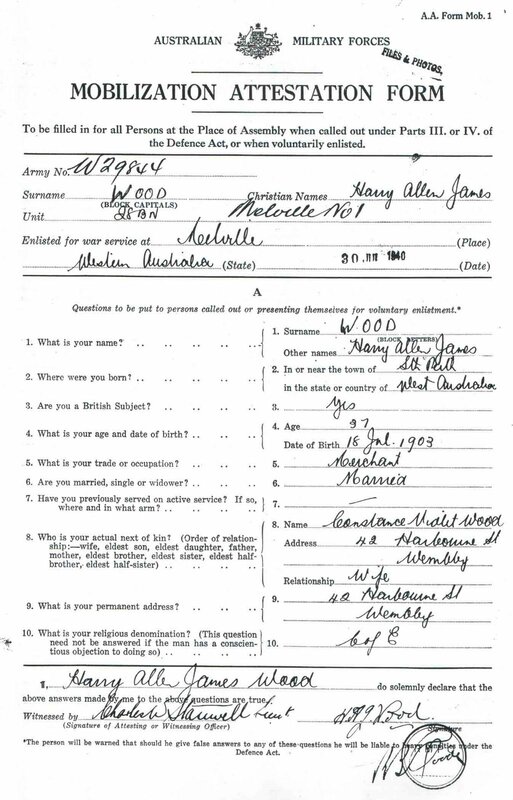 According to official government records, Michael Owen Mansbridge Wood (Father Michael) was born in Perth, Western Australia in 1940 (see attestation papers). He was the younger of two sons of Harry James Wood (born in Australia) and Constance Violet Wood (born in “British South Africa”). 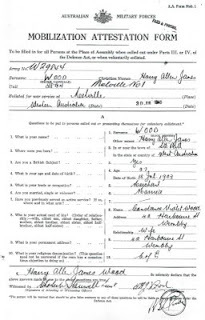 Michael Wood’s father’s occupation is shown as “merchant” on his enlistment papers. Other service documents show his occupation as “salesman”. He served in the militia (reserve) while working and in July 1940 was mobilized for full time service with the rank of Captain. All of his service during WW2 was within Australia. He was demobilized in December 1945 and was later involved for a period in the running of a hotel in Hall's Creek, in the north of Western Australia. Michael Wood grew up in Bassendean, a outer Perth suburb. After 3rd year he left high school with a Junior Certificate and worked in several different companies as a clerk for about 5 years before enlisting in the RAAF as a clerical assistant. He joined the Royal Australian Air Force (RAAF) in 1961 and was discharged in late 1966. Between 1967 and circa 1979 he lived in Sydney, New South Wales. He then left Australia for approximately 8 years before returning to Perth in 1987 where he remained for approximately 2 years. He again left Australia in 1988 or 1989, and again returned in 1991. He initially impressed during the RAAF recruitment process and was assessed as being suitable for a position of Education Assistant even though his level of education was below the normally accepted standard for this position. However he then failed the trade test and was placed in a different position. His subsequent on-the-job performance assessments were generally poor - but sometimes qualified with the sentiment that he seems to have plenty of ability but his performance always falls far short of expectations. He left the RAAF in late 1966 at the same rank (Aircraftsman-basically equivalent to a private in the army) as when he had joined and moved to Sydney. There he worked in various organizations in a variety of jobs as a clerk in general office duties. “The Pauline” (the magazine of St. Paul’s College, University of Sydney”) in the 1976, and combined 1977/78 issue records an M. Wood as a tutor in economics whom I believe is the same Michael Wood who is now Fr. Michael. In the late 1970’s Michael Wood left Australia for the USA and, perhaps later, the UK. In 1987 church records indicate that he had returned to Australia and place him in Cottesloe (a Perth suburb), Western Australia. “ I have searched some old files and have come up with a few details which may help you in your research. Oct 28 1987: ina[u]gural meeting to form a Continuing Church in WA six people present under chairmanship of MMM. It may help to know that Evening Prayer was conducted at Old Post Office, Cottesloe each Sunday afternoon from this date. Jan 2 1988: Visit of Bishop Mercer, ACC Canda. First Mass of ACC Australia. Public meeting held at Masonic Hall, Nedlands. He then apparently travelled to and spent several years in Colorado, USA before returning to Australia in 1991 or 1992. The orthodoxwiki entry describes the monastery as being “Anglo-Catholic” until 1995 after which “it turned to Orthodoxy and, under instruction, was placed under the direction of Patriarch Ignatius IV of Antioch”. A newsgroup posting also refers to the period 1995 to 1997. It is not clear from the posting (below) whether the monastery was then “Antiochian” had tried unsuccessfully to become “Antiochian”. The following describes the status of SPM as "effectively stavropigial" whereas in fact it was unsuccessful in engaging with Damascus. "Fr. Michael went back to England in 1994 where he had meetings with Fr Michael Keiser of the Antiochian Orthodox Church. He was in England in 1995 and again in 1996. At this time Saint Petroc Monastery was effectively stavropigial, directly under the guidance of His Beatitude, the Patriarch of Damascus." "Speaking as one of "these people", we came into ROCOR because the local Antiochian Orthodox Bishop would not countenance Western Rite and we spent two fruitless years trying to get the Patriarchate in Damascus to have the basic courtesy to answer the letters that one of their Archpriests instructed us to write to them. Then the Monastery was visited by the ROCOR Archbishop along with an Archpriest and a Priest. The Archbishop treated us with the utmost kindness and courtesy and after investigating us at great length and continuing discussions, we were welcomed into ROCOR. We have a great loyalty to our Archbishop, who has proved to be an exceptional father to us. That is why we stay. We are free to act throughout the diocese. Others, in other dioceses are not so fortunate and we all try to keep a relatively low profile because we do not wish to attract further attacks against our Archbishop by those who abhor the thought of WRITE. contamination. Fr. Michael." The history of the monastery prior to its reception into ROCOR between 1991 and 1997 is very unclear. I could find no information regarding any formal theological training undertaken or theological qualification (or indeed any tertiary qualification) achieved by Fr Michael either prior to 1991, or since. Only recently (in 2012) , in a personal email, Kenneth Graydon did confim that he had ordained Michael Wood into the Anglican Rite Jurisdiction of the Americas. In 1997 Michael Wood was listed by the Tasmanian Registrar General as being amongst “Authorised Celebrants - Ministers Of Religion For Recognised Denominations”. In 1987, according to Archbishop Hepworth’s email, Michael Wood did not hold a clerical office. No details relating to his transition from laity in 1987 to clergy sometime later in 1991, and subsequently elevation to Archdeacon in the mid 1990’s could be found. The following entry in Wikipedia refers to a diocese in Australia in 1987, and contains a reference to a diocese in Lambeth in 1993 “administered by an Archdeacon who later converted to orthodoxy”. on the Ely forum seems to tie in with the following reference. The Anglican Rite Jurisdiction of the Americas was an Anglican traditionalist church originating in 1981 from within the Anglican Catholic Church in the United States and with the assistance of the Philippine Independent Catholic Church. Citing political infighting within the Anglican Catholic Church, four of its clergy sought the help of the Philippine church in consecrating them to be bishops of a daughter province in which each of them would serve as bishop ordinary of a diocese covering one-quarter of the United States. In 1981, the PICC's ecumenical officer, The Most Rev. Francisco J. Pagtakhan, consecrated, in San Diego, California, The Rt. Rev. G. Wayne Craig of Ohio, The Rt. Rev. Ogden Miller of Oregon, and The Rt. Rev. Robert Q. Kennaugh of Texas. (The fourth candidate, The Rev. Herman Nelson of Florida asked for his consecration to be delayed. In 1985 he was received back into the ACC). The Anglican Rite Jurisdiction of the Americas sought to consecrate bishops with valid orders in an unbroken lineage of apostolic succession (the PICC had Old Catholic Union of Utrecht orders) in order to serve the needs of conservative Episcopalians who objected to the revision of the 1928 Book of Common Prayer, to the ordination of women, and to The Episcopal Church's relaxation of traditional rules concerning marriage and sexuality. One of ARJA's hopes was to be a force for uniting other Continuing Anglican churches which had remained independent of the Anglican Catholic Church. Of the initial three bishops of the church, Bishops Miller and Kennaugh are deceased, and Archbishop Craig retired in 1987. Along with his former parish in Columbus, Ohio, he subsequently joined the Episcopal Missionary Church. At its height, ARJA consisted of approximately a dozen parishes in the USA. In 1987, ARJA gained a diocese in Australia, headed by Bishop Kenneth Graydon, and in 1993 after ARJA's Archbishop Stephen Clark had visited England, they jointly began a missionary Diocese of Lambeth in London. Before its demise, this latter had several successive Episcopal Visitors and was administered by an Archdeacon who later converted to Orthodoxy. When efforts to unite with other Continuing Anglican bodies repeatedly proved unsuccessful, and following the departure of most of its parishes to various other Continuing Anglican jurisdictions, ARJA began conversations with the Episcopal Missionary Church. The EMC had been founded in the early 1990s by the Rt. Rev. Donald Davies, a retired ECUSA bishop. The talks were successful and a merger of the remaining ARJA parishes and clergy was agreed upon, thus ARJA ceased to exist. The last ARJA Primate, Archbishop Stephen Clark now serves with the EMC. No clear information could be found about how he acquired the title of Archdeacon of Lambeth. The following (from orthodoxwiki) of this page does not explain how the monastery was antiochian and answerable to Damascus (see below), yet the superior was at the same time Archdeacon of London and administrator of the diocese of Lambeth? I"t's pretty clear that this lazarus person doesn't know anything about churches - much less Orthodoxy. Patriarch's don't have to answer letters and what Fr. Michael seems to be saying in his emauil dredged up from six years ago is that he wrote some sort of reports to the Patriarch under instructions from senior Antiochian clergy, which implies to me that the senior clergy were answering him. Anyway, since I do have a fair knowledge of the Australian and New Zealand Orthodox monasteries, and I have access to most of them since they trust me, I shall continue to correct entries made on any of them, that I know to be incorrect. Personally I'm not going to ask any of them for bios because I know that having been tonsured a monk is supposed to leave his former life behind and begin again, the Church gives him that new clean slate. That's why this sort of behaviour - trying to drag someone down because they apparently don't like him, really annoys me. I think this orthodoxwiki should demand that people give their real names, their real emails and the name of their Orthodox Priest before they are permitted to post or edit anything. That way, if they behave like this, they can be referred to their bishop. I admit to being shocked that an Orthodox Priest would run this site on any other lines.Colin"
Note: Aristibule identifies himself as the webmaster for the monastery. Colin is not identified but from the context appears to be Fr Michael Wood. The following is an excerpt from a Tasmanian government website (http://www.parliament.tas.gov.au/ctee/old_ctees/euth.htm) refers to a submission from “The Venerable Father Michael”. From these fragments of information it appears that Michael Wood became involved with the “Anglican Rite Jurisdiction of the Americas” in the early 1980’s. He may have met Archbishop Hilarion during this period while he was in the U.S. In 1987 he was involved with the Traditional Anglican movement in Perth and apparently tried unsuccessfully to attract a group of followers. He later went to the U.K. for several years and returned to Australia in 1990 or 1991. It is possible that the ARJA (Bishop Kenneth Graydon) may have ordained him then. In 1991 Michael Wood became involved with the Traditional Anglican community in Hobart Tasmania and tried unsuccessfully to attract followers. Later still, in 1993 it appears that the ARJA may have appointed him as an Archdeacon in the”diocese of Lambeth, London”. It is not clear whether Fr. Michael was living in Tasmania or in the U.K. then. The ARJA disintegrated in the mid 1990’s the Episcopal Missionary Church took over some ARJA units. Somewhere around this time “he and those associated with Saint Petroc Monastery, were temporarily placed under the direct obedience to the Patriarchate in Damascus”. It is not immediately clear why ROCOR, which is essentially the “Outside of Russia” Orthodox church, would receive and ordain two Australians (Barry Jefferies was the other person) who apparently speak no Russian, have no Russian connections, have a very “foggy” theological background, and also a “foggy” set of theological credentials and experience. Also very unclear is why ROCOR would assimilate an objective, (Anglo-Saxon Celtic Western Rite Orthodoxy) which seems far from the general objectives of ROCOR. The following post suggests an aspiration for SPM to grow by attracting followers from existing churches and thereby cause “howls of clerical pain”. ………...Fr. Gregory is right to focus upon mission: Recently I went to assess the possibility of starting a second Parish in a city of 1.5 million people. The mission being to people outside Orthodoxy. I was opposed vehemently by the ethnic Priest of the existing Parish in that city, who simply saw no reason to reach out to the non-Orthodox and regarded another Parish (English speaking) in that city as a challenge to his authority. Even such few clergy as do see a reason to reach out to the non-Orthodox, nevertheless resist tooth and nail any diocesan missionary initiative as somehow an intrusion on their local authority. How do you deal with the anti-missionary attitude at this grass-roots level? Until it is dealt with, it is very difficult to lead by example. This Monastery has a task from our Archbishop to actively go and bring people into Orthodoxy - I have at present, current enquiries from clergy and people to become Orthodox in six cities. These will of necessity involve new Parishes - can you imagine the howls of clerical pain when these Parishes are erected? I think that the jurisdictionalism stands on a foundation of parochial turf defence (ego, power) and the jurisdictionalism (ego, power, ethnicity) stands in the way of mission (it powerfully deters converts) and the lack of missionary activity stands in the way of defeating jurisdictionalism. Some jurisdictions seem still to be awestruck by the Church of England and refuse to accept converts from it - they therefore refuse to spread Orthodoxy. So, who will stand up first and lead the missionary drive and, in doing so, point up the essential redundancy of three or four Orthodox Bishops in his area? Any takers? In Christ our Risen Lord. Following SPM’s reception by ROCOR Fr Michael started a variety of initiatives. The following lists the publicly visible activities which I could find. "I also spoke to Father Michael, of the Russian Orthodox monastery of St Petroc in Tasmania. The Russian Orthodox Church has had it pretty tough during the last hundred years or so, with persecution under the Soviet regime at home, and the privations of exile abroad. But exile isn't necessarily a bad thing for religion, in fact many Jews will tell you that exile is precisely what has given Judaism its characteristic identity. So I asked Father Michael if the same mixed blessing has shaped Russian Orthodox Christianity. Father Michael: Well Orthodoxy's been around for 2,000 years; it's managed to keep itself quite distinct and secure for 2,000 years. It's suffered a lot of persecution over time, it's not just in this century with the Communists in Russia and other countries, but also prior to that in Turkey, with the invasion of Islam and so on, and it continues to be under pressure in the Middle East, and very considerable pressure. So Orthodoxy has learned over the millennia; it doesn't so much adapt itself, it just knows how to handle itself when it's being persecuted. Christianity always works best in periods of persecution. It in a sense, you might say toughens it up, but it sorts out who are the real Christians. David Rutledge: So would you say then, would your message to the Pope this week as he convenes his Cardinals for this meeting where they're going to discuss the future of the Catholic church, do you think that this secularisation that seems to be worrying the Pope, is something that could actually turn out to be good for the church in the long run, because it's going to have that toughening effect? Father Michael: That's different. You have to look at the differences, in a sense, between Orthodoxy and the other Christian organisations in the world. Orthodox Christianity doesn't have a pyramid power structure, with a single point of power at the top from which all government and all decisions are initiated. Neither is it a professionally managed democracy. Now both of those structures are liable to corruption over time, one, because individuals or small groups of distant elite can be easily subverted by Satan into governing on entirely human terms. The other, because it enables infiltration, quite easy infiltration, of liberal humanists with their agenda, capturing the organisation. Now both of those kind of organisations, the infiltration of them, and the takeover of them, has happened to Christian organisations in this past century. Now Orthodoxy has historically relied on the whole membership jointly holding and being responsible for keeping securely of the whole faith, it's not the exclusive task of Patriarchs or Bishops or Priests, but everybody equally. So it's very difficult from outside interest to entirely capture the church, as has happened with other Christian organisations. Now you take the early church in the British Isles and Western Europe. Right at the beginning it was surrounded by active Paganism. The later church, by the end of the first millennium, had a triumphalist flavour about its worship, because it seemed to have won the battle. That triumphalism is quite misplaced today. We're back in the surrounding Pagan world, and we need a means of addressing it. So by going back and seeing how our forefathers dealt with the surrounding Western Pagan societies 1500, 1800 years ago, and reviving our genuine Orthodox Christian heritage, we can bring it to bear on that society around us today. An interesting little aside: most of the people who approach me because they found out from our website what we're doing, or something like that, are young people who want what we're doing. They realise that a lot of people are experiencing an emptiness at the centre of their life - people outside the church, people who are in no church at all. And mostly they cannot, even to themselves, articulate what that emptiness means. They're often repelled by what they perceive as the relative sterility of mainstream Western Christianity. Now Orthodoxy is essentially a mystical Christianity - although when it needs to be, it can be extremely practical. But they are starting to see that it is essentially a different way of answering the needs, it doesn't need therefore to somehow prettify itself up or to suit some particular fashion of the time. If the faith is real, if God really exists, if the whole of the Christian message is true, then it doesn't need to change anything. David Rutledge: And it doesn't bother you that young people might be approaching the Orthodox church as a sort of selection in the salad bar, if you like; you think that once they get into it a bit they will find that it's not just another choice? Father Michael: Oh that's made very clear. Nobody joins the Orthodox church easily. You don't just sort of bowl in and say 'I think I'll join this church this week and then wander off next week'. We don't let you. You'd be in inquirer for quite some time before anyone even received you into the Orthodox Church. We want our people to be serious about it, and so if they weren't serious when they started, they will be when they're officially received. Lyn Gallacher: Russian Orthodox priest, Father Michael, of St Petroc monastery in Tasmania." The proposed paper is in the nature of a report on work carried out at St Petroc monastery over the past two years. This project has been one of looking at the church in the British Isles (and of necessity, to some extent in Brittany and further afield) and most particularly the development of liturgical worship in that church during the period of the fourth seventh centuries. The object of the exercise was to determine if the liturgical remains from the latter part of the subject period could be restored in any practically usable form. Secondary objectives were to clarify the whole course of liturgical acquisition in the British Isles during the early period of Christianity, to ascertain if possible the earliest known liturgical traces, and the liturgical course subsequent to the holding of the Synod of Whitby. UTAS Chaplaincy“…Michael Wood made a number of representations to the university from 1997 onwards requesting to be appointed as a Univesity chaplain. This request was not acceded to and he has not been "accredited" by the University as a chaplain. In correspondance over the period June to November 2001 the University advised that four chaplains had been appointed over the preceding 10 years on the basis that they worked ecumenically and that there was no indication from students or staff that the University required any additional chaplains. · Further internet activity in 2003 or 2004, particularly on the “York Forum” (see www.ezboard.com). Subsequently he established the “Ely Forum” also at www.ezboard.com”. I seem to recall one entry describing this forum as his “cyberministry”. SPM has never to my knowledge published any statistics or reports about its evangelical activities. From a variety of secondary sources and indicators I estimate that over the period of nearly 10 years since its reception into ROCOR, SPM has achieved perhaps at most a dozen committed “followers” worldwide. Roughly there are about 3 or 4 in Australia, another 3 or 4in the USA, and a perhaps few in Europe and the UK). Some of these followers have been associated with SPM since its inception in the 1990’s. Others have joined over the past decade, mainly in more recent years. I could find no indicators that this “inner group” contained anyone who had significantly changed their religious “direction” as a result of SPM’s influence or any evidence of significant “Greenfield” conversions”. It appears that most or all were all strongly precommitted to Write/orthodoxy even before becoming closely involved with SPM. There also seems to be a second tier of followers – not so committed-which seem to number another six or so. The number of people in this second group is fairly constant but the composition of this second tier seems to change frequently. It appears that individuals come, stay for a while and then leave, and are replaced by yet others. For some reason they just don’t stay. I notice too that there are many “spectators” who come and go without making any contribution to the discussion. The following provide qualitative information about SPM’s evangelical progress. “…He [Michael Wood] came to ROCOR and was received through baptism, chrismation and then reordained to start a missionary group using the Western Rite. In fact nothing visible has occured to date. During a personal interview in 2004 involving SPM and its progress, Archbishop Hilarion indicated that nothing had been achieved. Clearly ROCOR, as the sponsor, of the SPM evangelical initiative has been disappointed. There are other indicators, such as an apparent inability to attract funding (bemoaned in Ely forum posts), soul searching about marketing etc which underline the lack of progress and absence of temporal success of SPM’s evangelical initiatives. The following shows a marked change in expectations in comparison with the “howls of clerical pain” 1998 newsgroup posting. The recent postings also show a marked change in “ownership” of responsibility for evangelical success of the whole initiative. The more recent postings by Fr Michael convey the impression that he has distanced himself from personal responsibility for the failure of the initiative. I think that Fr. Peter has said that very well - especially the bit about it being decades or centuries. After all, when Saint Aristibule yurned up to get things going, he didn't suddenly have a national Church in his lifetime - he'd have been lucky to have had one operational congregation in his lifetime, although I suspect that he may have done a little better. In any case, I'd rather build slowly and surely. If the Holy Spirit wants fast - then no doubt He'll raise a Saint Paul or two to to run things. Another post by Fr. Michael and one of his followers relate to a lack of evangelical progress. One of the most difficult problems is the "how" of evangelism. We have cursorily looked at several ideas on this Forum. 1. Advanced Enquirer’s Meetings. In which the evangelists, together with Enquirers who have already been taught the essential Christian doctrines and are continuing their studies, shall meet to read and discuss the New Testament (and the explanations of the Fathers). These meetings should be held twice weekly, each evangelist taking a turn at conducting the meeting. All members shall be expected to attend: If anyone is unavoidably prevented from attending, he should go over the content of the missed meeting with someone who was there so as not to impede the progress of the others. 2. Early Enquirer’s Meetings. In which those men, women and children, who are commencing their catechumenate instruction are taught by the evangelists about the Creed, the Lord's Prayer, and the Ten Commandments etc. These meeting should be held twice weekly. In addition to these two kinds of meetings, the evangelists should go about the city every day trying to find new enquirers. If among those interested there are people who are unable to attend the above meetings, the evangelists should go to their homes to teach them there about the Creed, the Lord's Prayer, and the Ten Commandments. This is to be regarded as of the utmost importance and should be done even if, because of time limitations, the evangelist finds it necessary to be absent the meeting (1) for reading and discussing the New Testament. When people have been thoroughly instructed in the Creed, the Lord's Prayer, and the Ten Commandments, and are established in the faith, they shall be presented to the Priest for Baptism." It was expected that instruction in the Faith should continue on an organised basis beyond Baptism, until all members of a mission were fully instructed as Christian laity capable themselves of accurately imparting the basics to others. Saint Nicholas taught a respect for the indigenous culture, language and spirituality, he desired Orthodoxy to be the truly indigenous Church, not a pseudo-Russian transplant, with the converts expected to become “Russian”: Adopting the local culture was necessary in order that Orthodox Christianity would become truly indigenised and accepted. Fr. Nicholas had his first break when he met and converted an hostile Shinto Priest, then used him to begin to build his team of Evangelists. The Evangelists were his vanguard, they went ouit and approached people while he oversaw the training. There is no doubt that Fr. Nicholas was a proactive evangelist. He certainly didn't sit around waiting for people to come to him. The question for us is: What can we learn from Saint Nicholas. and how do we apply this in our own town? I do not want to be negative, but this is going to be the most difficult part, surely. It was probably easier to approach someone in downtown Tokyo an hundred plus years ago, and get an expression of interest, than in the modern west. I suppose the young might be able to do this amongst the clearly disaffected, who might be desperate enough to come along just for the coffee and snacks. How does one convince a cynical and lapsed Anglican or Roman Catholic to join. How does one spot them; most people are suspicous of discussing religion in the workplace. If one goes to their door or approaches them in the street, the immediate thought (and mental warning light) says "Flee, Jehovah's Witnesses" or "I gave at the office". How does one make that initial approach. Notes in shop windows? Adds in the free press? Stand outside Anglican or catholic churches on Sunday handing out leaflets? Infiltrate the evangelical protestant sects? Once they are netted and landed, the teaching part and conversion should be straightforward because they have self-selected as wanting to find out more. The following post suggests that Orthodoxy would succeed evangelically if only the right marketing tool could be found, or the right marketing button pressed. Eastern philosophies/religions such as Buddhism, which appeals to the former hippy brigade, and does not really involve worshipping anything, or more correctly worships anything that's handy. Islam, which attracts the bewildered young who actually want a set of rules and discipline to guide them. This implies that Orthodoxy might appeal even more if they were exposed to it. The happy/clappy evangelicals and "tolerance", perhaps the greatest trap set by the devil in modern times. I suspect many people wander into one of these "churches because they see nowhere else to go. They percieve the Anglican and Catholic churces as having lost the plot. The field for seeding Orthodoxy is fertile; the problem we have is delivering the seed and actually sowing it. We need to learn how to market our Faith. The problem is few of us are any good at it. "The purpose of the Paruchia is to make Orthodoxy accessible to people whose western culture makes access via the Byzantine worship and ethnic communities of most Orthodox communities, difficult. By and large the elements of the paruchia do not advertise themselves, but spread by word of mouth. The purpose being to enable those already seeking, rather than proselytising." Intended to be limited to about 80 - 100 members after which they form a daughter mission. They can start out as the aforementioned "study societies" while waiting to be received. I'm not too worried about waiting for trained missioners (or even Priests) at first (although they would be better). Saint Petroc Monastery is composed of several separate semi-eremitic houses, each occupied by a Hieromonk. The original house began formally in 1993, originally with two semi-eremitic monks. This developed over time to two separate houses, Saint Petroc House in Cascades and Holyrood Hermitage in Avondale. The Monastery also has other hieromonks who are presently assigned to run non-monastery parishes, associated with it. The Monastery came under the omphorion of His Eminence, Archbishop Hilarion of Sydney in August 1997 and has remained as an official monastery of the ROCOR Diocese ever since. 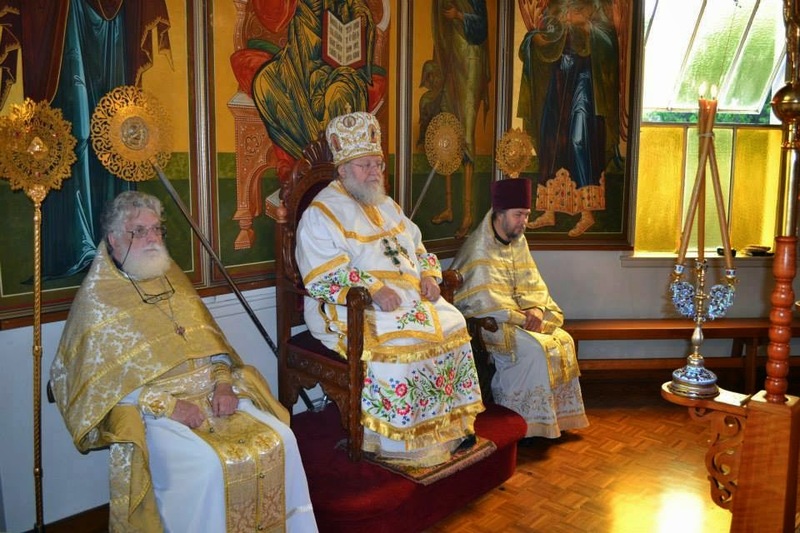 The purpose of the Paruchia is to make Orthodoxy accessible to people whose western culture makes access via the Byzantine worship and ethnic communities of most Orthodox communities, difficult. By and large the elements of the paruchia do not advertise themselves, but spread by word of mouth. The purpose being to enable those already seeking, rather than proselytising. Over the years, the Saint Petroc method has facilitated the conversion of a number of Protestant clergy, including one bishop, as well as individuals and small groups. Not all of these come under the Monastery, but are often directed eventually to a local ruling bishop. The Monastery also provides retreat directors for those member groups of the paruchia wishing to introduce new members to Orthodoxy. It keeps in close contact with the paruchia and provides ongoing catechetical and liturgical material for members. The Monastery is engaged in the ongoing task of producing liturgical resources for western rite Orthodox parishes. Saint Petroc House and Holyrood House do not have visitor stay facilities, since this is difficult for such eremitic houses. In terms of personal achievement I believe that Fr Michael can claim some success. In 1997, through ROCOR, he and his associate finally achieved a clear and unquestioned ordination with formal and robust theological legitimacy. Fr Michael, as far as I know, has never provided explicit information on the legal basis and details of his earlier (i.e. prior to ROCOR) transition to clergy in the early 1990’s. It was only in 1997, that his name first appeared on the list for TASMANIA - Authorised Celebrants - Ministers Of Religion For Recognised Denominations. Another personal success resulting from his ROCOR endorsement was in ultimately gaining visiting rights to UTAS as an unpaid “chaplain. In practical terms this meant access to a fully maintained office and access to a chapel, as well as the “cachet” associated with a University affiliation. Father Michael’s origins. His earlier statements inferred that his origins were “English”. In early published material there are references to him “coming to Tasmania from England”. Other statements refer to spending time in Australia and the USA. In one post he states that he was born in Perthshire [a county in Scotland]. Also there are references to “arranging a move back to England”. Of course he is Australian, his father and mother were Australian, he was born in Australia and has spent most of his life in Australia which he finally declares in December2006. position statement on this List. diocese (and also our Chaplain to the local University). stream of continuity in Britain. Archdeaconry of Lambeth. There is some difficulty with the date on which he resigned his English archdeaconry. In December 2006 he gives the date of his resignation as taking place in 1995 yet other material indicates that he was using the “Venerable” title in 1997.
customs and knowledge of the Old Liturgy. Both Marshall and Mascall were highly regarded theologians. Dr Barry Marshall, who died in Oxford in 1970, was Chaplain of Trinity College in Melbourne between 1961 and 1969. Eric Mascall died in 1993. It is unclear and very unlikely that these two people would urge Michael Wood towards ordination in the context of his background. “You have me flummoxed - I have absolutely no recollection of Mr Wood. But I should advise you to be cautious. There is no diocese of Lambeth in either the Church of England or the Roman Catholic Church in England. I could find no evidence of a marketing strategy, nor anything which could be recognized as a continuing, systematic goal-oriented set of activities focused on the achieving the evangelical objectives of SPM. The objective of the early internet activity of Fr Michael seems to have been to establish himself as an authority on details of orthodoxy. Certainly the steps taken by SPM seem to have been low in terms of energy and oblique in terms of focus. Some of SPM’s early initiatives seem to be bizarre. For instance, in one of the earlier yahoo group posts Fr Michael invites people to emigrate to Australia, support themselves and place themselves under his guidance to perform the basic legwork needed to establish parishes and attract converts. He repeated this offer more recently in an Ely posting. SPM’s marketing appears to have been heavily reliant on the internet. The original SPM website was bland, contained no hard information about the monastery, and essentially asked for donations. It apparently first appeared around 1998 and remained unchanged and untouched until recently when it was removed. The newer website is much more elaborate, contains some pictures, and also contains a complete issue of the St Petroc Magazine (the only one apparently published on the web). The Ely forum (http://p097.ezboard.com/ELY-FORUM/belyforum) now also appears to be the an important vehicle in promoting SMP’s cause It appears that quite a few people have visited the forum, stayed for a while, but have eventually moved on. I like the short Medieval mitre (also called 'Anglican') - it is recognizable as a mitre still in our day. I think it is basically 13th c.? 11th c. would have had that 'horned' mitre - something that looks like the illustrations one sees of Aaron the High Priest (a round mitre like the third depicted) - I like that form as well, but I'm sure it would get raised eyebrows, though it might bring to mind the Old Testament priesthood. The early form is not that different than the tiara, and much like the early Eastern mitres. That is, 1 and 2 on the diagram - the first is a linen pilos (pointed linen cap) with camelaucum (a golden crown). The first is also called the 'frigium' and is like the Roman mitre, only joined on the sides (a single horn - rather like the Coptic priest's mitre.) The second is the mitra clericalis - having become a domed shape. The earliest tiara is like the pilos, but conical rather than an arched dome. Before the camelaucum (gold crown) was worn by the bishop along with the pilos (liberty cap). So - I'm still on the side of the Medieval mitre, though it became popular post-Schism, it is instantly recognizable as a mitre in the West (and, unpretentious.) The earlier forms seem to call for going with conical chasubles, etc. Another impression was that the SPM “flavour” of orthodoxy was a long way from the warm (happy/clappy?) end of the continuum. In fact it projects as being quite severe and cold – very much a “sword of the lord” approach. I was also surprised at the tone and content. For instance there are posts which react with ferocity against perceived evangelical competitors. Elsewhere I found a posts referring to suggesting the need for a crusade. Fr Michael is one of, and the dominant one, of four administrators of this (Ely) forum. In essence I think that this whole initiative arose from an approach to ROCOR with a proposal by SPM to deliver to ROCOR a sizeable group of disaffected Anglicans in return for ROCOR’s recognition and endorsement of SPM. My guess is that there was an arrangement for SPM, in return for recognition and endorsement, to bring this disaffected group to ROCOR, and to progressively add more converts from the “disaffected segment” of the Anglican community. And of course non of this has apparently happened. I could find nothing else seems to explain why ROCOR would receive and endorse SPM and its principals in the context of their background. It is unclear why ROCOR continues to support this initiative which in any other context would be regarded as having well and truly failed. It is possible that ROCOR continues to hope that SPM’s fortunes will change though on the information I have there is nothing to suggest that the future prospects of SPM are likely to improve, or that success is just around the corner. It is also possible that ROCOR continues to endorse SPM because, in financial terms it is costless (I believe ROCOR makes no payment to Fr Michael), and that while ROCOR continues to provide endorsement and support SPM it does not have to explicitly acknowledge or admit to a mistake or to a failed initiative. I just wonder what "due diligence" ROCOR might have performed before becoming involved in this initiative? ROCOR seems to have given much and received very little from this initiative. I wonder too if ROCOR is aware of how ROCOR feels about the recent redefinition of SPM's objectives? While I have much unused research material there is not much more to say. This is a failed initiative which is in keeping with the past limited achievements of the main people involved. Essentially a repeating theme seems to be that of creating expectations which always seem to fail to be delivered. It will be interesting to see what happens to SPM now that ROCOR has now been reunited with the Russian Orthodox Church. SPM has tried several new initiatives over the past year but, as before, they seem to have come to nothing. Certainly the Ely forum has all but died on the vine, and the number of SPM devotees seems to have shrunk dramatically even from previous microscopic levels. The web presence of those that remain seems also to have all but disappeared. One has to marvel at the perseverance and motivation of SPM in the face of so little success and achievement over such a long period of time. 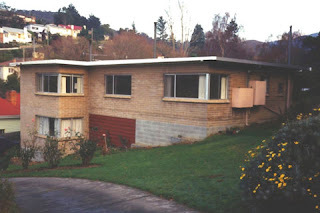 As far as I am aware 'St Petroc's Monastery' is one bloke living in a suburban bungalow in South Hobart. This mission/church/communion/rite whatever seems to have a much bigger presence on the web than it does on the ground. I think St Petroc's claims its own distinctive liturgical use - does every priest of Western Rite Orthodoxy have his own liturgy? St. Petroc's does have a web address but it appears to be dead. That's why it was omitted from the report (I speak as editor). If they knew they couldn't expect much of a turnout, it's odd that they'd go to the trouble of inviting Archbishop Hilarion to the event. Maybe they thought he'd be a draw. " True - and I think the Antiochenes have probably been much more successful at fostering Anglophone parishes - both WR and Byzantine - than most other Orthodix jurisdictions. Abp Hilarion is in Sydney and St Petroc's 'monastery' in Hobart, though. And I wonder if +Hilarion is ever bothered by the fact that in Hobart he has a WR cleric with little or no congregation and a Russian parish on the other side of town with no priest. Orthodox Churches per se aren't a ver big presence in Oz. I have ministered in 6 hospitals over the past 12 years, and have met only 2 Orthodox patients, and no Orthodox priests. I guess there might be a few more around in each hospital, that I don't see... However, there are lots of mornings now when I sort out patient lists according to ward and religion, and I would be surprised to actually see any Orthodox names, and even then, all the Orthodox are listed together. Oddly enough, the Orthodox family I got most involved with (of these 2) kept coming to our (Protestant ) services of communion, and participating. They used to talk about the balance between theological belief and their grandma whose dieing was causing them unimaginable grief, and the comfort of the sacraments. I figured that as long as they decided they knew what they were doing, then that ws up to them. " One of the unfortunate facts of Orthodox life is the historically inadvertent but nevertheless uncanonical proliferation of extensions of all the national Local Churches of Orthodoxy into the western world, with the resultant duplication of dioceses in a manner which blatantly violates the order of the Church. This does not help Orthodoxy in its mission to bring the fulness of Christ to the West. We, in Western Rite Orthodoxy have also to worry about duplication problems which blunt the message of Christ and our mission to our people in the West. In a sense, it is unfortunate that the Holy Synod of Russia authorised several Western Rites for use. (ROCOR later authorised a third (Germanus) and it seems that a Moscow Patriarchate Archbishop has authorised a fourth rite (Stowe)). Because of this, we see the unedifying spectacle of two liturgically warring groups operating within the Antiochian Western Rite Vicariate in the USA - with those wanting what is essentially Roman Catholic Tridentine churches and ceremonial, with statues and all the late second millennium devotional additions such as the rosary, exposition, benediction, birettas, stations etc., in opposition to those who prefer the (much) modified sarumish usages which they grew up with in their former days. Add to this the intrusion of a highly incorrect book (albeit beautifully and expensively bound and printed) having its origin in the "Milan Synod" purporting to be Sarum, but which is in fact merely a collection of obscure, very localised variations pasted together for their presumed acceptability to Byzantine liturgical sensibilities. None of these things is authorised within the Russian Church. The Russian authorisations were made upon the submissions of Dr. Overbeck and Archbishop (Saint) Tikhon, both of which were non-Tridentine based submissions. Following on from that, and the liturgical work of Abbot Augustine, from within ROCOR, Archbishop Hilarion has authorised the Saint Colman Prayer Book for our use. It contains three versions of the Divine Liturgy, with one (Sarum based) ceremonial standard for all three rites. The three versions of the Divine Liturgy therein are: The Sarum (Usus Cascadae); the English Liturgy and the Liturgy of Saint Gregory (Usus Providentiae). The Book contains a simplified Breviary and all the common occasional Offices needed by a Parish Priest. I think that if we all adhere to one or other of these three Liturgies, making our own ROCOR Book standard and as far as is possible, ordering our churches and chapels to a very basically compatible standard, we could avoid the problems that the Antiochians have fallen into. This means ignoring the pseudo-Sarum of the "Milan Synod" book, the various Anglican, Roman, Antiochian Missals and others floating about which have no Russian Orthodox authorisation. The Liturgical practices of Christminster, Holyrood, and Saint Petroc are quite compatible, without dispute amongst us. I think that it is incumbent upon us belonging to the Russian Church, to set the standard for Western Rite usage and behaviour within the whole of Orthodoxy. We can do this by ensuring that we really are well educated in the Faith and the Liturgy and by observing a strong liturgical discipline and a degree of ritual and ceremonial unity, stemming from one specific book which has clear authorisation within ROCOR. We need to avoid at all costs the ad hoc liturgical sloppiness and late Roman innovations of the past three hundred years, that we see sometimes amongst the Antiochians. The choice of Liturgy contained in the book that we now have, is up to each ruling bishop and his parishes, and ought not to be the subject of dispute between clergy and laity from different parishes. So long as none of us is using blatantly Tridentine ceremonial, vesture, devotional additions or decorations, we will escape the indiscipline and disruption which seems to dog the Antiochians thereby damaging the whole cause of Western Rite within Orthodoxy and beyond. Of course, this is far from being the beginning and end of our mission to our people, however, internally, it is only by clearly and obviously keeping a strict adherence to Orthodox teachings in their fulness while maintaining disciplined liturgical unity, that we will ensure that we nullify the criticisms of those who oppose the Western Rite within Orthodoxy and widen our acceptability with bishops who might otherwise perceive us as potentially disruptive or divisive. In the aftermath of the Church of England's General Synod decision to go right ahead with bishopesses, and of the shambles that Rowan Williams has managed to make of Lambeth, it is timely to say out loud to Church of England laity, that there is an alternative to the pseudo-leadership of the papacy. The Pope is neither the only nor the best way for members of the Church of England to go!! How many Church of England people realise that the Western Rite was first authorised for Orthodox use specifically IN ENGLAND over a hundred and thirty years ago (just after the Primus of Scotland had visited Russia and discussed unity with Church authorities there - and reported his conversations to the Convocation of Canterbury)? How many realise that services extracted from the Book of Common Prayer were authorised for adaption for Orthodox use over a hundred years ago?Embryo Western Rite parishes/missions can be formed immediately in England (or Scotland or Wales) and seek immediate Orthodox oversight while they prepare themselves for formal reception. A Western Rite Orthodox Prayer Book already exists - it is just a matter of them making contact with us. To clarify - there was no open letter. The letter by Fr. Michael was a private letter to the missions, hermitages, and study societies of Saint Petroc Monastery. I was one of the few original intended recipients - and this was the letter released after it became apparent that it had been intercepted, given a wider circulation, and a sinister reading by those of ill will. In the first place the letter was not public and was intended as an internal document. Unfortunately I blind copied it to one outsider who innocently decided to forward it to one or two others, thus enabling anyone of a mind to do so, to to cause as much trouble as they could - and someone apparently did just that. I should point out that that outsider has this morning sent me a written apology for having forwarded it to others. A number of people not included on the original address list, having received this essentially private letter, have become upset and even angry at certain of the terms used in the letter. Unfortunately, it happens to all of us that when some part of a document offends us, we tend to fail to appreciate the overall intent of the document or indeed to take into account other aspects of it. We often then proceed to misread the remainder of the document or to read into it things that were never intended by the writer. The choice of Liturgy contained in the book that we now have, is up to each ruling bishop and his parishes, and ought not to be the subject of dispute between clergy and laity from different parishes. My citing of the Antiochian examples came from letters and telephone calls that I have received from Antiochian clergy and laity over the years, telling of often bitter criticisms aimed at them from within the AWRV by fellow clergy whose liturgical usage differs. Indeed I have been criticised by at least one such clergyman for precisely the fact that I do not follow the practices that he prefers. My references to the AWRV were entirely of the nature of examples. I did not deplore the numerous versions of the Western Rite in authorised use within Orthodoxy, I merely commented to the effect that life might have been simpler had there been only one. I had in mind the Overbeck version. One of Fr. James's correspondents chose to then attack me (I had not knowingly attacked him) as being somehow "Triumphalist" because we "deluded" ourselves that we are "official". I don't know how he reads that into the letter - it was merely me writing primarily to those missions, groups and clergy affiliated or otherwise connected with this monastery. The underlying statement in this text-- that "I think that it is incumbent upon us belonging to the Russian Church, to set the standard for Western Rite usage and behaviour within the whole of Orthodoxy" -- which comes from their recent union with the Moscow Patriarchate, giving them a renewed sense of "officialdom" that requires that they bash others in much the same way the Patriarchate bashed the ROCOR in earlier years, is based not upon any interest in "restoring the Western rituals" within Orthodoxy but in consolidating their own power. That writer is correct in identifying the words "I think that it is incumbent upon us belonging to the Russian Church, to set the standard for Western Rite usage and behaviour within the whole of Orthodoxy" as being an underlying text - albeit a secondary one - but to then assume that it has anything whatsoever to do with the rapprochement with Moscow or "consolidating their own power" is both inaccurate and totally unfair. I might point out that I voiced some reservations about the rapprochement among our ROCOR clergy, and I think I might fairly ask "what power?" - I/we have none! I referred to us once as "mice in the Byzantine barn" - and one of our people once described Saint Petroc's as the "Orthodox Department of Waifs and Strays" (my favourite as it happens) - hardly indicative of any delusion of power (and if it existed, it would indeed be a delusion). Please try to remember that this letter was addressed exclusively to people who are affiliated with this Monastery or in close contact with us. It had no intended application whatsoever to anyone outside. The "we all" meant the legitimate addressees only. I have on numerous occasions tried to invoke joint approaches with the AWRV - such as long ago trying to get input for the Saint Colman Prayer Book; inviting their clergy to participate in the Ely Forum and trying to make the online Western Rite Newspaper "Orthodox Christian West" a place where all Western Rite events were evenly presented (all the initial reports there were of Antiochian matters) however I have been unable to get Antiochian input. I should point out that our relations with Antiochian Western Rite clergy and people in this country are very close - on a weekly basis - we have each participated in the others' events - we have had one joint conference - indeed we cooperate wherever possible. I wholeheartedly apologise to those people who have felt themselves or their Vicariate attacked by my letter, I ask them to bear in mind that it was intended for just the eleven legitimate addressees (including Archbishop Hilarion) and no -one else, and that my references to their Vicariate were intended as examples only, not as attacks. I am relying on Fr, James and others to now ensure that this letter of apology is circulated to all those who have made themselves known to him as being offended, for not one of them has contacted me directly. “Noting that the corrective is over a year old, it should be asked just *why* some are attacking Fr. Michael with obvious falsehoods? Of course, that isn't the depth of the matter either - its been ongoing for nearly a decade that I'm aware of. To clarify - there was no open letter. The letter by Fr. Michael was a private letter to the missions, hermitages, and study societies of Saint Petroc Monastery. Yes, we know that what Fr Michael had intended as an inhouse letter was released on the Internet. Thereby it willy-nilly became an open letter the content of which has disturbed Western Rite people. Their disturbance can hardly be denied given their reaction, nor can it be said that they misinterpreted the letter. Nor is Fr Michael's understanding of his relationshop with the Antiochians anywhere near as sanguine as your own. Noting that the corrective is over a year old, it should be asked just *why* some are attacking Fr. Michael with obvious falsehoods? Of course, that isn't the depth of the matter either - its been ongoing for nearly a decade that I'm aware of. mannered for "sides" to have been taken ..... so I won't, however I would like to say that Fr. Following a period of illness in early 2009 involving brain/pituitary gland surgery, Fr Michael was active again. In late 2009 he was in the U.K. He spent time in Bournemouth and held a number of Western Rite services there (in one of the East Cemetery chapels in the Pokesdown area of Bournemouth). He also held several more services in London, but apparently these ended abruptly when access to the venue for these became unavailable. Since then there has been no public information about his activities. His Ely forum is virtually defunct with just several new postings-mainly enquirers from Poland-which generated minimal responses. In the meantime it is not clear whether he has abandoned his activities in Hobart. There was mention of a novice in Australia and a mission in Darlinghurst, Sydney under Fr Michael's care. Again it is not clear how these are being managed, if at all, while Fr Michael is in the UK. Also he is still listed as a visiting chaplain on the UTAS faith centre page even though he has apparently been living in the UK for an extended period of time. [apparently the novice has since left, and nothing more has been heard about the Darlinghurst mission]. Over the past 12 months Archbishop (now First Hierarch) Hilarion has personally involved himself in supporting initiatives to promote Western Rite, but, in spite of this high level support, Fr Michael's efforts have never really achieved any form of traction , ignition or sustained growth. Since the previous update, nearly nine months ago, there has been no further visible evangelical progress. Father Michael is now approaching 70 years of age, and facing uncertain health. In the past 13 years he has made virtually no tangible progress and it is clear that his best efforts and energy are in the past. It is not clear so far whether he will continue with his efforts to promote Western Rite, given his lack of achievements after having dissipated the best of his personal resources. SPM protagonist responded by claiming that many lies had been published about SPM, and that this website is false. When invited to specify such material the people involved, particularly “Aristibule” declined to do so and instead focused on denigrating the author of the blog. Numerous and very serious pejorative references were made about the motivation, credibility, actions, character and mental state of the author. “Why? [comment removed] Fr. Michael still hasn't read the website - but he is aware what is on it (and many of us are aware why the website is false.) The action being taken is appropriate to the 'merits' of the website - it has no merits, and needs no challenge. What good does it do engaging them? More time wasted. What good comes of it? Too much to do already. That's what the S.'s/CSJ want - time wasted, effort wasted, destruction of Fr. Michael and Western Orthodoxy. It isn't Feminist/Unitarian enough for them. It would make as much sense as trying to argue with those who believe the moon is made of cheese, that the earth is flat, or that the world is run by lizard-people. The moderator subsequently removed the most of these pejorative comments. As the discussion continued, more pejorative statements about the author were made. The moderator of the forum locked the thread, then removed it and replaced it with the following statement. I have deleted the entire thread on the Western Rite Monastery that was thought to be in the works for the USA. Initially, I intended to split out the acceptable posts, but the result was a disjointed and unintelligible thread. I therefore deleted it completely. I was dismayed that this thread continued on so long, with so much back-and-forth, full of speculation, about a person who does not even post here. It would have been much more appropriate to focus on the question of WR ROCOR missionary work and left the issue of one of its priests aside completely. Furthermore, the bringing in to the discussion of a critical blog of uncertain provenence, and the subsequent discussion of that blog's operators (even though never named here) was inappropriate and unnecessary. I am disappointed by all who chose to take part in this thread in this way. Please do not repeat this mistake, or you will be given formal sanctions. Part of the reason for starting this blog was a serious concern about how SPM had been representing itself since its inception in the mid 1990s. For instance, in the early years, Fr Michael projected himself as being English when in fact he was an Australian. Also there is much very heavy fog about most aspects of SPM qualifications, theological training and experience, and its claims about evangelical initiatives, progress and achievements. Over the years there have been many critics of SPM which have been brutally attacked by a small handful of SPM protagonists. Perceived spiritual competitors of SPM have been treated in the same way. In this regard one of these, “Aristible”, has always enthusiastically played an active “attack dog” role. With the objective of restoring my personal and professional credibility I offered SPM the choice of either retracting these comments, or seeing SPM’s credibility tested by providing the link to primary source material regarding Fr Michael’s air force service record. SPM chose the former option, and “Aristibule” continued to escalate these pejorative comments to the stage where the whole thread was removed by the moderator. Consequently I have decided to publicize the link to Fr Michael’s full service record which was published in 2004 and has been publicly available for the past 6 years. The publisher is the Australian Federal Government (National Archives of Australia). This record provides much of the source material in this blog, and should help people make their own independent assessment about this blog’s accuracy and veracity. The full service record of Fr Michael covers many pages and provides a full picture of his capacity and performance in the RAAF. p73 recommendation for discharge - with the comment "little use to the service"
SPM continues to foment controversy and division. Michael Wood has began using the title “Abbot” the legitimacy of which is strongly disputed by his peers. SPM has inducted a female novice who lives in Edinburgh, Scotland even though Fr Michael has apparently returned to Tasmania. There are claims that Fr Michael has adopted a secret separate persona “Owain Harrison” which he uses to post discussion group messages write in support of himself. which amongst other things refers to numerous previously unmentioned missionary achievements including some in continental Europe and others in Asia. Given the fundamental mission of restoring “Anglo-Celtic-Saxon” Orthodoxy it is curious to see Singapore and the Philippines being claimed as successes. In March, the homepage displayed the following message, and all of the other pages disappeared. Yet some weeks later the website was restored and this message disappeared. We had hoped to be able to use this website to make new missions and study societies more widely known, particularly to enable the faithful to pray for them, but experience in two regions has taught us that there are those opposed to the restoration of Western Rite Orthodoxy who will stoop very low indeed to pull our new little plants up by their roots. Therefore to protect converts and those whose path to Orthodoxy is not conventionally easy we have decided that new endeavours will now only be made known to the Metropolitan until they are strong enough to withstand their enemies. We are sorry beyond words that we have to act like this. It is heartbreaking to have to put such an announcement on a website dedicated to evangelism but as things stand we have no choice. In May 2011 Michael Wood was suspended from all priestly and liturgical duties by First Hierarch Hilarion. The suspension notice is shown below. provides no indication of changes in current arrangements or the future of its various initiatives following the issue of the notice of suspension of Michael Wood. The following website has not been changed since the suspension. http://stpetrocmonastery.blogspot.com/The Monastery is headed by its Abbot, Fr Michael, and consists of several houses which are geographically spread - according to the work given to the Monastery by His Eminence, the Primate of the Russian Orthodox Church in the West. His appointment by the Metropolitan as being in charge of English missions is only some twelve months old and is a very welcome challenge. Also it is not clear how the suspension will affect the 2 novices that SPM claims are under guidance, the spiritual welfare of its devotees, or the University of Tasmania "chaplaincy" because at present he is prohibited from performing any priestly or liturgical duties. There is still no mention on the "All the News" page of the flagship SPM (Wordpress) website about the suspension of Michael Wood. The last entry predates the suspension date by a few days. Also all of the SPM devotees who are normally vociferous on the web have been silent. Curiously too, there has been an abrupt halt to any discussion on the web about the subject of suspension by his colleagues. Is this the end of SPM's evangelism initiative? There are rumours (unsubstantiated) that the suspension has been lifted but it is difficult to see a viable future for SPM even if this is the case. At worst if the suspension is not lifted then there is no way forward for SPM as a ROCOR establishment. At best, even if it is true that the suspension has been lifted -either wholly or in part- then SPM's status within ROCOR would appear to be badlyand irreparably damaged. Particularly it is difficult to envisage a continuing role for Michael Wood as a close advisor of First Hierarch Hilarion. www.orthodoxchristianity.net/forum/index.php/topic,36636.0.html (reply 36)Fr. Michael's suspension has been lifted, but he has also been relieved of all duties except for caring for St. Petroc's in Tasmania. If so then it appears that SPM's "global" evangelical role and advisory position to First Hierarch Hilarion is at an end. fellowship: no more UK or other countries. That was Metropolitan Hilarion's decision. The suspension of Michael Wood has been lifted but with conditions that limit SPM’s future activities to Tasmania. In many ways these restrictions put SPM back to where it was 14 years ago. It was then that it first became part of ROCOR and was given the task of attracting large numbers of disaffected Anglicans to ROCOR/SPM. The tenor of the words in the suspension and the restrictive conditions under which it was lifted convey the impression that the ROCOR hierarchy views SPM with disfavour and places little importance on SPM’s future role in ROCOR. In other words ROCOR appears to have in essence served Fr Michael Mansbridge Wood with a retirement notice. In 2007 this blog concluded that the SPM evangelical mission had failed and that the monastery had become dormant. SPM/Western Rite initiative was considered a failure because it had not produced any visible results in either Tasmania, or the rest of Australia after 10 years of activity. More recently Fr Michael caused more discussion and generated much scepticism by conferring on himself the title of “Abbot” by using heroic logic to justify this. In mid/late 2010 SPM launched its flagship website (Wordpress). This website was promoted as being a Western Rite portal and placed a very positive complexion on SPM as a substantial, rapidly growing and successful entity. The site appeared to project SPM as being a substantial entity witha global influence and a presence in the UK, Europe and the Philippines. Yet anecdotal information currently puts the number of SPM WR devotees, after 14 years of global canvassing, at around 8 in the UK, less than a handful in Australia and a very small number elsewhere. SPM never discloses statistics on its activities no alternative reliable factual information on numbers is available. What is clear is that ROCOR has effectively turned off life support to SPM’s missionary activities and removed its principal from an influential role as advisor to the primate of ROCOR. These actions support a view that SPM has failed to impress ROCOR with its evangelical activities and achievements. Some years ago this blog canvassed the question of why SPM has had such limited success in attracting people to its variant of WR Orthodoxy. It is suggested again that the main reason was the naive and incorrect premise that there were vast numbers of disaffected Anglicans who were prepared to change churches. · the general calibre of the principals, the absence of any former significant achievements and formal tertiary qualifications. Air Force records document a capacity to initially impress but subsequently disappoint through lack of performance and this pattern appears to have repeated. · the way that SPM represented itself by exaggerated claims of success, the use of clever wording to improve its c.v. and the citing of achievements that, when checked against source, were not supported. (These are raised as questions earlier in the blog). As an example of clever wording, in a Caslit forum message (see caslit message “SHYLY INTRODUCE OURSELVES” earlier in the blog) he introduces himself in the following way; my comments in square brackets I have not corrected the spelling errors in the original emails. Nowhere in the message does he mention Australia. "...I was born in Perthshire [Perth, Western Australia], brought up near Guildford [in Bassendean, a suburb of Perth which is near another suburb called Guilford] and have spent much time since, in the West Country [Western Australia]..."
Ultimately these types of discrepancies and contradictions would caution me, and I guess others, to proceed with care. "The academic programme outlines is rather grand and his hopes of financing it are naive-and A.C. Wood has more than once shown the tendency to assume the completion of what is but an idea in his mind"
I do not think the grand vision of a mass exodus of disaffected Anglicans to Orthodoxy was ever realistic. However if the individuals involved with this initiative were different, different methods were used, and the complexion presented was different then perhaps the overall may have been much more successful than it was. So is the SPM story over? That very much depends on what its principals, particularly Fr Michael, plan to do. If he chooses to remain under the direction of ROCOR then I believe it is the end of this story. If he decides to continue with his activities outside Tasmania then he will have to leave ROCOR, lose his clerical credentials and legitimacy, and revert to being a layman again. Only time will tell. The first (from the closed yahoo groups occidentalis forum) provides further clarity by Bishop Jerome to the the issue of the various SPM overeas affiliates. I have referred several times to the various (numerous) websites and other missions and initiates but have never bothered to put a complete listing together. Someone else has, and I decided to include it even if just for posterity. "under" Fr. Michael, and St.
"affiliates" in the Western Hemisphere. the contrary do not change this. I presume he has informed Fr. the Orthodox student fellowship at a nearby university. Re: Why isn't Western Rite Orthodoxy thriving? [Five members on the Australian continent after 13 years of missionary activity is quite a small number. Not that we want to judge a spiritual work by numbers. Do you know the Petrochian figures for its WR mission in the UK? It would seem to be a mission urgently in need of the prayers of all those who want to support the Western Rite. I don't know the Petrochian mission numbers for the UK. I believe that if one sees the many Petrochian paruchia websites that one can easily see the scope of their many activities. That there is no western rite in the major cities of Sydney (4 million) and Melbourne (3 million) may be attributable to many things. Certainly the established ROCOR parishes in those cities - about 12-14 parishes have many western clergy serving and many Byzantine rite western laity, as well as both English language and Greek/English monasteries. The Monastery came under the omphorion of His Eminence, Archbishop Hilarion in August 1997 and has remained as an official monastery of the ROCOR Diocese ever since. 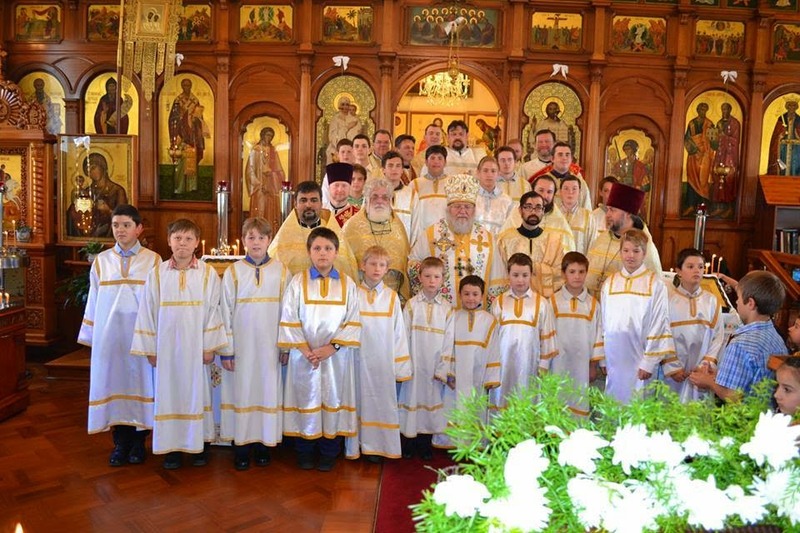 The purpose of the Paruchia is to make Orthodoxy accessible to people whose western culture makes entry via the Byzantine worship and ethnic communities of most Orthodox parishes, difficult. By and large the elements of the paruchia do not advertise themselves, but spread by word of mouth. The purpose being to enable those already seeking, rather than proselytising. Over the years, the Saint Petroc method has facilitated the conversion of a number of Protestant clergy, as well as individuals and small groups. Not all of these come under the Monastery, but are often directed eventually to a local ruling bishop. The Monastery is engaged in the task of producing liturgical resources for western rite Orthodox parishes. The St Petroc blog sites also has a saintpetrocmissionarysociety.blogspot.com with missions in the Philippines (2) and the United States of America (1 or 2?) so clearly the Petrochian paruchia is achieving in the mission fields if it has 300 catechumen in the Philippines. I hope and pray that a missionary monk-priest or priest can go there and begin the baptisms, bringing these souls to Jesus Christ. Saint Petroc Monastery Missionary Society is a Society set up to promote the missions run by Saint Petroc Monastery, to facilitate their funding and to assist the missionaries in the field. Saint Petroc Monastery currently runs missions in the Philippines, England, Australia and the USA. Mostly these are "green fields" missions starting from scratch. Saint Petroc Monastery does not have access to official Church funds, large private funds or bequests, we rely entirely on the giving of devout Orthodox Christian Believers. The Monastery is directly under the control of His Eminence, Metropolitan Hilarion, the Primate of ROCOR. Missionary work at all levels - the individual - and the mass foreign. We are looking at participating in an Orthodox school in London, we are opening missions in England. We have opened two missions in the Philippines (300 people) - so the missionary work just never stops. The money however is another matter - there's none of it! So we have to find what we can wherever we can. Pray for money for the missions in England and the Philippines! So Father this equals 8 missions under the Petrochian Paruchia spreading Western-rite Orthodoxy in 4 countries - Australia, Philippines, United States and the United Kingdom. I am not aware of the Launceston mission being closed as Priest Barry Jeffrey is still resident there although currently serving in Hobart fortnightly in the absence of St. Petroc Monastery Hieromonk Michael (Mansbridge-Wood), the Australian superior of the monastery-missionary WR organisation who is currently visiting the United Kingdom and has reported great success in evangelism. The Philippine missions site has the capacity for people to donate funds for their missionary work - a worthy outreach to see these souls baptised. Is there the prospect of a permanent priest in the Philippines? If they have 300 souls in 2 centres it would be possibly the largest western-rite parishes in the world. I have now seen a email from Kenneth Graydon confirming that he did perform an ordination on Michael Wood and stating that this ordination was presumably extinguished during his (Michael Wood's) later ordination(s). Kenneth Graydon appears to have left the Apostolic Church many years ago. A google search "Kenneth Graydon apostolic" and "Kenneth Graydon organ regeneration" yields quite a number of results showing he is now very active in the "Wellness" industry. There has been no visible activity by SPM since Fr Michael's suspension and its subsequent conditional lifting. However none of the numerous SPM websites appear to have been updated to reflect the change in Fr Michael's personal status within ROCOR, and the prohibition of SPM's activities beyond Tasmania. In fact most of these sites still refer to his status as Assistant to Metropolitan Hilarion with oversight of Western Rite Missions in Britain. His Ely forum still receives around 30 visits per day even though there have been no new posts since about April this year. Neither Fr Michael nor his devotees had been active on any public discussion groups since around May last year, but recently both Fr Michael and "Aristibule" reappeared briefly on the yahoo groups Occidentalis forum. They addressed concerns about their involvement with the Philippines mission and their failure to update their numerous websites. FrMichael Hieromonk-since the latter half of 2011 and is now posting frequent updates and details of his journey in the U.K.
"Assistant to Metropolitan Hilarion for the United Kingdom." although he was removed from this role when he was suspended in May 2011. On the "wordpress" website the "all the news page" has been selectively updated, still showing a report that he was made Assistant to Metropolitan Hilarion but failing to mention his subsequent suspension, removal from that position, and the restriction of his activities to Tasmania. The St Petroc Monastery page also shows some changes. Fr Michael now claims to have had an "Anglican Ordination" (suggesting perhaps that it was into the mainstrean Anglican Church) rather than the "Anglican Rite Jurisdiction of the Americas church". That was an Anglican traditionalist church originating in 1981 from within the Anglican Catholic Church in the United States and with the assistance of the Philippine Independent Catholic Church although I believe it is now defuct. It it not clear whether Fr Michael has any further role at the University since the premises in which he has had an office is no longer available and he appears to have no students involved with him. In fact it appears that since he has no involvement with the mainstream ROCOR community in Hobart he may not have any practical on-the-ground role there at all. ROCOR has confined him to activities solely in Tasmania and therefore, in practical terms, this leaves him with essentially nothing to do. Fr Michael has amended his facebook page. Michael Wood returned to Hobart, Tasmania from Scotland in March 2012. His facebook page still states that he lives in Edinburgh. Recent entries on his fb page include numerous photos of country houses and churches in the UK, and most recently he has started to publish some homilies. Michael Wood, now in semi or full retirement, returned to Edinburgh some time ago and has been active on Facebook. He has started yet another new website and continues to comment on various matters regarding the Anglican and other churches. Also he has made some new entries in his previously defunct "Ely Forum". While his FB page and wordpress websites still allude to him holding a senior and influential role within ROCOR (Assistant to Metropolitan, a site of Saint Petroc Monastery, a monastery blessed to the Western Rite by Metropolitan Hilarion, and directly under his personal oversight) the reality is that ROCOR appears to have retired him. Metropolitan Hilarion issued the following decree several weeks ago. It appears that this suspension and forceable retirement of Fr Michael and withdrawal of blessings for his websites is permanent. In view of his vio[l]ations of the canons by disrespect of the person of the Patriarch and other members of the Hierarchy, lengthy absences from his parish in Hobart, Tasmania, causing spiritual neglect of the faithful of his church community, and the constant inflammatory and unedifying negative comments which he publicly broadcasts within the religious media, bringing disrepute to the Orthodox witness of the Western Rite movement, Hieromonk Michael (Mansbridge-Wood), cleric of the Australia and New Zealand Diocese of the Russian Orthodox Church Outside of Russia, is hereby suspended and relieved of all his priestly duties and obligations concerning the Western Rite in the United Kingdom and elsewhere, and is retired from active service in the Church. Given the above, any and all blessings for his websites are hereby withdrawn. In the past Fr Michael was able to claim both a close working relationship with and a high degree of personal support from Metropolitan Hilarion. This relationship appeared to evaporate when Fr Michael was suspended in May 2011 and he was removed from his position as personal assistant to the Metropolitan. 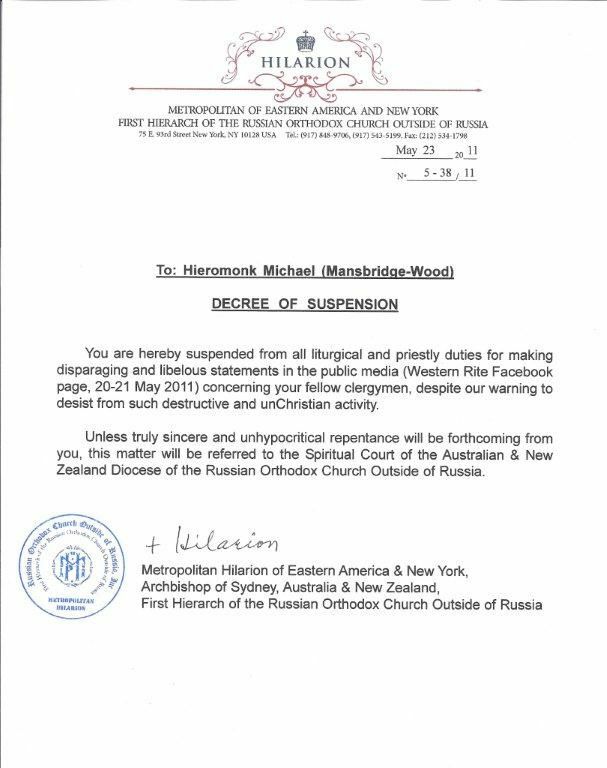 In this latest decree, the Metropolitan very forcefully and clearly disavows any endorsement or support that Fr Michael was previously able to claim. Does this finally mean the end of Fr Michael's evangelical endevours? Time will tell. It is difficult to see how Michael Wood will continue with his evangelical endeavours unless ROCOR releases him from his ordination vows so that he can try to affiliate with a different jurisdiction. In the meantime there are still many websites that contain obsolete information. Most appear to be directly under the control of SPM. There are several others that describe their activities as being "under the guidance of SPM". Most or all of them still claim Fr Michael to be assistant to the Metropolitan, although that hasn't been the case since May 2011. All of these websites now contain incorrect information about his role and status within ROCOR and will need to be either decommissioned or altered. These include the following, but there could be others as well. 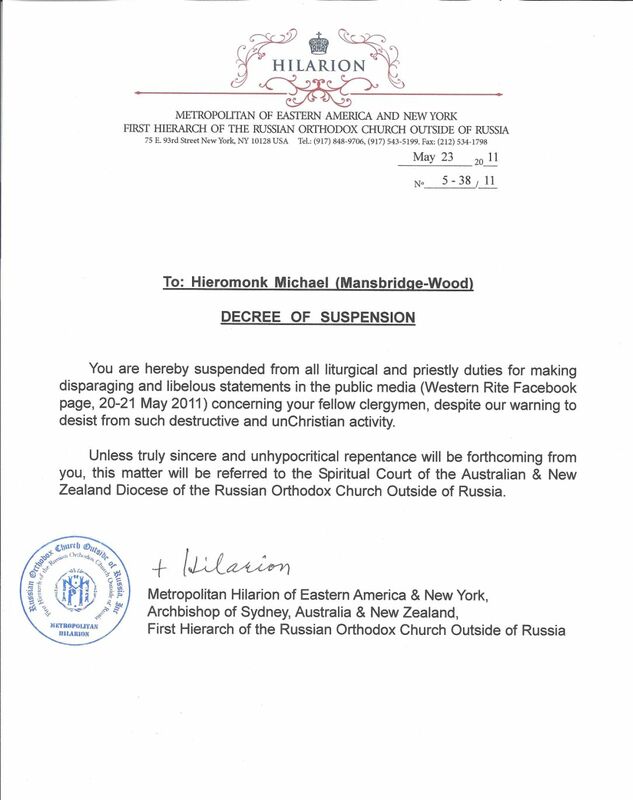 Recently Fr Michael was suspended, retired and “de blessed” by Metropolitan Hilarion; ending up in a situation that seems to be just one step short of having been defrocked. Now Fr Michael has published a letter saying amongst other things that “I think the time has come for me to part company with ROCOR.” This is most curious and akin to someone deciding to resign after having already been fired. In 1997 as a former Anglican, born and brought up in the Church of England and a clergyman of the Continuing Anglican church, I was received, Baptised, Chrismated, Ordained and Tonsured in the Orthodox Church by his Eminence Metropolitan Hilarion. At that time ROCOR was barely in communion with any outside jurisdiction, reckoned by many (most?) as uncanonical and yet highly regarded as holding fast to genuine Orthodoxy. It had for many years been led by a series of First Hierarchs of the greatest integrity, men held in awe by many Orthodox people around the world. ROCOR eschewed false ecumenism, regarding it as an heresy, it did not recognise the "sacraments" of any non-Orthodox church. I felt thoroughly in tune with the ROCOR of those days. When the rapprochement with the Moscow Patriarchate was first mooted, I was unhappy, having served in a position where I was privy to the communist government's fifty year control of its 1947 creation, and in particular of its complete control of the DECR and its use of it as an adjunct to other government external agencies. However I and other clergy in ROCOR decided to sit it out, since we did not expect it to happen in under ten years. We were surprised at the sudden crumble of ROCOR into almost instant rapprochement. Nevertheless we decided to continue in ROCOR and see what happened. Since that time, I have seen nothing so disappointing as the vast changes within ROCOR, even evident on the clergy email list. The ready acceptance of Moscow's misleading statements designed to cover their real motives regarding the so-called ecumenical movement, their acceptance of Metropolitan Hilarion (Alfeyev) and his ongoing flirtations with Rome, their readiness to accept as "traditional' anything that Moscow presently does. So the whole of liberal Moscvism surges through ROCOR leaving perhaps a few isolated islands of old fashioned Orthodoxy. This has weighed heavily on my conscience for the past few years but against that I had to balance my loyalty to my Metropolitan who had received Baptised and Ordained me. A few weeks ago, as you know, I was suspended and retired. What you may not know is that there was no warning and I have not seen the evidence against me nor been given any chance by my bishop (the Metropolitan) to defend myself. Regarding the accusations in the decree of suspension-retirement: As to “bringing disrepute to the Orthodox witness of the Western Rite movement” I am at a loss and if I didn't consider the situation tragic I might laugh. ROCOR's Western Rite Vicariate is largely composed of rapidly received ex-vagantes whose history and behaviour has already brought disrepute of a magnitude I could never produce (what else do you call it when another jurisdiction has to intervene to prevent an ordination?) and will – as many of you have stated recently – bring much much more major scandal in the near future. I have no recollection of disrespecting the patriarch, in fact the last thing I said about him publicly was that he was very well placed to lead the re-evangelising of Europe if he so chose. My friends and I have received a barrage of vicious pseudonymous email recently (and for some years in the past) from two sources in ROCOR – forgive me – too stupid to cover their tracks. I have seen episcopal injustice (spurious charges and no opportunity to reply) and summary dismissal. Bishops in ROCOR and other jurisdictions have observed all this and have warned myself and some others of us of the likely consequences of incompetent leadership. They have characterised some of these matters as blatantly uncanonical. I think the time has come for me to part company with ROCOR. I have accordingly, held a meeting of the main people of our Hobart mission, where I explained to them what has happened, the vicious politics and the changes in ROCOR. I told them that I could no longer stay in ROCOR. They were already aware of some of my feelings. The Mission will remain intact under Metropolitan Hilarion, with Fr Barry in charge - as has been the practice for some considerable time. On the 15th of March, I was notified in writing of my reception by his eminence, Metropolitan Daniel of the Metropolitanate of Moscow (TOC-R). This was followed by the necessary decrees. The decrees stated that I am a Hieromonk of Metropolitan Daniel's diocese, resident in the United Kingdom. The reaction hasn't all been positive. The following 2 critical comments appeared momentarily on his fb page before he deleted them. In the end, selective deletion of comments critical of Fr Michael on a forum that purports to be open is not likely to serve him well nor enhance his credibility. Nick Katich All the sanctimony...and then this? Something is "wrong" in "Denmark". I see comments were deleted about this and the non-canoniciyty of this new jurisdiction. I assume this one will be deleted as well. Best wishes in a non-canonical jurisdiction. Maybe our common "friends" will see this before you delete it. Maybe the will see this site as well: before you delete it. And I actually liked you. Peace. Christos Jonathan Seth Hayward I have not enjoyed times when someone said, "We're just going to give you some basic information" and in fact it is NOT just basic information, but basic information, plus pressure to dig deep into their projects, plus several other things. You have not merely transferred to a new bishop. You have transferred from the true Cistern to one that is broken. In writing this blog I have come to find that there is generally much less to SPM than meets the eye. In the "leaving ROCOR" letter Fr Michael appears to portray himself as an innocent "victim" of forces and circumstances. The letter indicates a sense of denial by Fr Michael that he had any personal responsibility for his plight, or absence of success, or his ultimate fall from grace and that everyone is at fault except him. He expresses disappointment with the direction that ROCOR has taken. However non of this disappointment was evident until his loss of position of influence as assistant to Metropolitan Hilarion in recent years. He refers to vicious politics yet he and a small band of his devotees participated in the most divisive, ferocious and pugilistic interactions with his detractors on many forums over many years. He states that "ROCOR's Western Rite Vicariate is largely composed of rapidly received ex-vagantes" yet seems to forget that until ROCOR his former clerical status clerical provenance was regarded as far from unquestionable. In terms of the future direction of SPM and Fr Michael that nothing has changed except the "organizational vehicle" in which he now travels. He again now starts from square one but with a record of past failures and a blemished record from ROCOR. During the 16 years that he was under the ROCOR banner he achieved nothing visible. Now, with this blemished record, and operating under a different and much less known and illustrious banner, he is again going to try to evangelise the west from the same starting position that he was in 16 years ago. Fr Michael's appointment and transition to a new jurisdiction has already created unease and suspicion about his envisaged role. Editorial: Is it “Open Season” on the American and West European Metropolias? "...... It is with this background in mind that initial plans were in the works for the annual meeting in Greece between the heads of the three Churches. That was, of course, before the reception of a priest who had actually convinced clerics of the former Milan Synod Archdioceses just a few years ago to secretly commemorate the Moscow Patriarchate, eventually leading to small schisms from what would become the American Metropolia. Already clerics have expressed suspicion that Fr Michael’s move was carefully orchestrated to attack the Metropolia “from inside”. Sources within NFTU have heard Metropolitan John’s immediate concern is that the Russians may inadvertently allow the use of Anglican services into the communion and has asked, on the basis of his experience and jurisdiction, to review Fr Michael’s plans. Considering the treatment of Metropolitan Onufrie in January, and considering the TOC-R has just moved into the British Isles not with the intent of establishing a metochion but a British mission, we are forced to ask if perhaps he should have a different primary concern......"
The Right Reverend Abbot Michael. Administrator for the British Isles. Western Rite Orthodoxy in the British Isles has been determined by the Holy Synod in Moscow to be administered by Metropolitan Daniel, who has appointed Abbot Michael to assist him. Abbot Michael was raised to his present status by the Holy Synod in April 2013. The Synod discussed the whole question of the United Kingdom and Western Europe, having been addressed by Metropolitan Daniel on the subject of the secularisation of western society at all levels and the problems facing the Church of recalling the west to its Christian roots. The British Isles and Western Europe will be administered from within the UK with the Administrator living in a monastic hermitage and travelling all over the UK and Europe, with outreach already in both the United Kingdom and Europe. An advisory group of laity is in the process of being set up to work on ways and means of operating in the UK and Europe. Those interested in having a serious UK Orthodox Church rooted in our culture, with a resident hierarchy, should talk to Abbot Michael. Since St Petroc Monastery will soon cease to exist there will be no further activity involving SPM and it would hardly be appropriate to maintain this blog as a continuing account of SPM's evangelical endeavours. Also I'm not sure how enlightening it would be to continue to record, even in this new "reincarnation", the evangelical activities of Michael Owen Mansbridge Wood. After all this reinvention process has become quite repetitive and predictable. The process seems to involve a new beginning with a great flurry of fanfare, a grand vision, no mention of past failures the adoption of impressively sounding titles of questionable provenance, the establishment of multiple websites claiming great successes and a large following. Eventually, on the basis of past experience, most claims are likely to be shown to be highly inflated and transient. For instance, after all the years of activity under the SPM banner, the numerous websites, claims of huge numbers of active missions and entities under the "guidance" of SPM the end residual reality seems to be to no more than 2 of three commited devotees. In his new role he is described as the Right Reverend Abbot and refers to "Those interested in having a serious UK Orthodox Church rooted in our culture, with a resident hierarchy". Presumably he is saying that those few who he may have attracted to ROCOR orthodoxy are now not getting the best; and they would now benefit by leaving ROCOR and joining him in his new organisation which is "a serious UK Orthodox Church rooted in our culture" and which has (him?) as resident hierarchy. Essentially he appears to be "poaching on his old patch". A most curious and bizarre state of affairs! Fr Michael has created yet another website to launch his new missionary initiative. The "about us" page once again describes a grand and ambitious vision to evangelise the UK and NW Europe with his particular flavour of Orthodoxy. as at Sunday, 16 June 11:29:45 p.m.(GMT ) presents, so far without any attribution or acknowlegement, the work of Professor Greg Carey which was originally published in the Huffington Post, and reprinted elsewhere. This is not a good look for someone who purports to occupy the high moral and spiritual ground. As in the past, the attribution is likely to come eventually (or the page removed) when confronted. Imagine a world in which the average life expectancy for women is 25 or 30 years, where men’s average life expectancy is more like 40. Imagine a world in which the average woman must complete pregnancy at least five times — just to hold up her share of the population. Imagine cities in which perhaps one in three inhabitants are slaves. Imagine living on a street lined with four- or five-story apartment buildings, a street only six or eight feet wide and served by no public plumbing. Imagine living with no meaningful police force, where the strong almost always get their way and violence frequently resolves conflicts.What would religion look like in a world like that? Religion offered two major benefits for most people in the Roman Empire: protection and belonging. You and I may have learned about the classical Greek gods in university, but the early Christians (those who were not Jews) inhabited a richly populated spiritual universe. Local gods, regional gods, professional gods, family gods and household gods expected recognition and required satisfaction. Evil spiritual forces also lurked, threatening to harm the unobservant. Acknowledging the gods, whether through direct personal worship or through public festivals and ceremonies, provided protection for households and communities. Moreover, honouring the gods fostered community, as trade guilds, burial societies, ethnic groups, and extended families linked religion to their diverse group identities. Earliest Christianity offered one alternative movement in that complicated spiritual economy. Emerging from Judaism, a significant ethnic and religious minority identity in its own right, the first churches stood among those ancient religious movements that offered individual mystical experience, promised the ability to transcend death and cultivated alternative communal relationships. Their competition included popular philosophical movements that trained people to discipline themselves in order to transcend suffering and respond to Fate (capital F) with freedom and equanimity..."
Just out of curiosity I'm interested to see how long this page remains in existence or there is a reference to the original author of this material. I'll check every few days. I have found it prudent and fruitful to run any material from Fr Michael's various sites through a pragiarism checker just to make sure it is his own actual work.
" It's indeed a pretty shameless use of my work"
I wonder about the following? "....We are building a small chapel on private land in Edinburgh...."
Does this mean a garden shed in someone's backyard? He also has a novel way of justifying the use and appropriation of other people's work without acknowlegement or attribution. "..... We have decided not to attribute particular articles as they tend to be either collaborations or arise out of conversations about things we have seen and heard". "Copyright is asserted over the contents of this board. Those copying material from this board for reproduction elsewhere on the internet will be pursued." now does attribute the content to Professor Carey. Fr Michael continues to both have a way with words and with a way of improving his c.v.. See below for Fr Michael's recollections on facebook (24th July 2013) about his time in the Royal Australian Air Force. The picture he paints is stirring and rosy but far removed from the facts in his air force file. And while I was in it, I actually did a lot of flying - mostly of course with instructors. I have to say that it was the extremely high quality of the men that I served with that survives all these years. I lost touch with most of them, virtually my only contact being with a retired Air Vice Marshall who lives near me, and (until he died) with a survivor of the Dambusters and latterly via an internet site. Fr Michael continues to confound. I googled one of the sentences in his fb post above and was presented with the following url. "PPRuNe Forums (The Professional Pilots Rumour Network). PPRuNe Forums (The Professional Pilots Rumour Network)." I served in the Air Force (with a "Royal" in front). And while I was in it, I actually did a lot of flying - and of course with instructors. I have to say that it was the extremely high quality of the men that I served with that survives all these years. I lost touch with most of them, virtually my only contact being with a retired Air Vice Marshall who lives near me, and (until he died) with a survivor of the Dambusters and latterly via this internet site. But they were men of quality, real men, men whom I could admire, with whom I was glad to serve/serve under, men whom I respected enormously. Royalistflyer is credited with 49 posts since 2010. So, is this another persona adopted by Fr Michael? that Fr Michael has improved his title by adding "The Right Reverend"
Administrator for the British Isles." Is this a self bestowed title I wonder. Given the wikipedia description below this title seems to be very grand and inappropriate for and individual without church or flock living in a suburban bungalow in Edinburgh. The Primate of ROCOR brought ten former Anglican/Roman parishes with their clergy into ROCOR as WRITE. The Hermitage of Saint George took possession of 48 acres of land in New Mexico for the construction of a monastery. The Primate issued a letter naming Fr. Michael (Abbot of Saint Petroc Monastery) as in charge of Western Rite missions in his Diocese. The Holy Synod of the Metropolitanate of Moscow decided to raise a diocese covering the United Kingdom and north western Europe. It named Metropolitan Daniel as the ruling bishop and Abbot Michael as the Administrator. It raised Abbot Michael to the title Abbot of Edinburgh as a territorial abbot. The Administrator of the UK diocese Abbot Michael took up residence in Edinburgh. That in 2011 Fr Michael was suspended from all priestly duties by ROCOR and removed from his position as Assistant to Metropolitan Hilarion. Later that year the suspension was lifted but Fr Michael was confined solely to his parish duties in Tasmania. That in 2013 Fr was suspended, retired and "all blessings withdrawn" by Metropolitan Hilarion. Later that year Fr Michael "left" ROCOR. Subsequently he was appointed as a priest by a different Church. Again, Fr Michael has a way with words to improve the complexion of his history. Fr Michael or, as he prefers to call himself, Abbot Michael appears to have found permanent lodgings in the house of his former novice in suburban Edinburgh and has essentially retired. He has built a garden shed chapel, and interacts on FB with a mixed cohort of friends/followers. There is no indication of any achievements of substance in his evangelical role with his new Orthodox Church affiliation. Is Fr Michael back with ROCOR after a stormy and colourful career culminating in his "being retired from" and his subsequent decision to leave ROCOR and become "Abbot of Edinburgh" with a rival organisation? His FB page says that he was in Sydney, Australia earlier this week and the photos were taken then. He is pictured sitting with Met Hilarion at an ordination ceremony involving a novice with whom he was associated with several years ago. So, if this is true then ROCOR also moves in mysterious ways. Alternatively its also quite possible that these photos were actually taken much earlier than claimed- perhaps prior to MW's "departure" from ROCOR. It looks like he's back with ROCOR. Western Rite Orthodoxy is alive and well in the Russian Orthodox Church Outside Russia (contact Metropolitan Hilarion) (USA, Canada, UK, Germany) the Antiochian Orthodox Church (USA) the Romanian Orthodox Church (France) the Serbian Orthodox Church (Switzerland). There are around sixty parishes and monasteries. Western Rite in the United Kingdom. Head of the Church's Western Rite in the British Isles and Western Europe. Perhaps it is a little premature to say "he's back". Both he and Metropolitan Hilarion have so far been silent about this. Clearly though, he has stopped publicising his affiliation with the "True Orthodox Church-Russia" and has given a plug to ROCOR. Perhaps he's just trying to work his way back. What a tangled web! MW's journey back to ROCOR will require a lot of mental gymnastics by many people including MW and Metropolitan Hilarion. In view of his vio(l)ations of the canons by disrespect of the person of the Patriarch and other members of the Hierarchy, lengthy absences from his parish in Hobart, Tasmania, causing spiritual neglect of the faithful of his church community, and the constant inflammatory and unedifying negative comments which he publicly broadcasts within the religious media, bringing disrepute to the Orthodox witness of the Western Rite movement, Hieromonk Michael (Mansbridge-Wood), cleric of the Australia and New Zealand Diocese of the Russian Orthodox Church Outside of Russia, is hereby suspended and relieved of all his priestly duties and obligations concerning the Western Rite in the United Kingdom and elsewhere, and is retired from active service in the Church. Given the above, any and all blessings for his websites are hereby withdrawn. Metropolitan Hilarion, Archbishop of Sydney, Australia and New Zealand, First Hierarch of the Russian Orthodox Church Outside of Russia. Taking into account the letter of release 2-28/13 on February 23, 2013 His Eminence Hilarion, Metropolitan of Eastern America and New York, First Hierarch of the Russian Orthodox Church, as well as a petition filed by Hieromonk Michael (Mansbridge-Wood), about taking it to the fold True Orthodox Church, Fr Michael (Mansbridge-Wood) is accepted into the clergy of the diocese of Volokolamsk and Kolomna True Orthodox Church. "The chapel of Saint Mary the Virgin built next to the new temporary Monastic house in Edinburgh in 2014, under the omophorion of His Eminence, Metropolitan Hilarion, First Hierarch of ROCOR"
So, I expect that any follower of MMW would be somewhat confused. MMW is now back Scotland. Still no mention of his current status and provenace of his title of "Abbot". I am curious to see what might appear in his FB under the "Works at Orthodox Church"
Our new temporary shrine to Saint John of ShangHai, with its flesh relic of Saint John having just arrived in Scotland a few days ago. The relic was given us by his Eminence Metropolitan Hilarion of ROCOR. Saint John please pray for our endeavours here in Scotland." So his brief affiliation with the Volokolamsk and Kolomna True Orthodox Church is apparently at an end. Yet another new website! Back with ROCOR. "Reblessed". Probably in a "retired" capacity. Stranger than fiction! I've looked at the website which is, as a virtual "imaginary hermitage", well established but there is nothing on the ground. In fact there there is no ground! I always thought a hermit was someone who seeks solitude and spends their time in prayer and penance. Is a hermitage with a website and loud and ongoing active web web presence an oxymoron Fr Michael? I'll check you fb page occasionally for your answer. now includes a potted version - in the form of an "interview" with MW-of their view of the the history of MW and of SPM. Not surpisingly, this version puts a very rosy and favourable complexion on the past activities of MW. Also, it is very selective. In many cases the events described in the interview are highly exaggerated or at variance with the facts. The history also omits any reference to the many failures of SPM (such as his suspension, and his brief flirtation with the True Orthodox church). I'm in Scotland at the moment and may contact Fr Michael for a chat or interview if I can find a little spare time. Just didn't have time on this visit to contact MW but perhaps next time. If MW does indeed want to start a hermitage on the road to Iona I saw many places for sale along the way. One of his colleagues described MW's achievements during his first 10 years at SPM using the words "nothing visible has occurred". So perhaps this hermitage idea is yet another pipe dream of MW. Time will tell. I've had another look at the "interview" with MW by his former novice. I think is more hagiography than interview. Certainly his initial "questionable" (very questionable) ordination by Grayden is glossed over as are his unsuccessful efforts to connect with Damascus. What did strike me though was the way his affiliation with UTAS is portrayed. Firstly it happened in late 2001/2002 and not 1998. "Q. Did you enjoy your time as chaplain? A. Yes, ultimately I did even though I didn't volunteer for it in the first place - it was an obedience - and I was sorry when it was closed"
Also no mention of his 2 suspensions. "Way back when I read theology, I managed to scrape through because of my interest in mediaeval Church history and liturgics." I certainly can't find any verifiable evidence of him "reading theology". So when and where did this happen? "The new regime in ROCOR Western Rite is, I believe going to thoroughly and rigorously investigate the past lives of any clergy attempting to join ROCOR Western Rite. There will be no easy passage in." This is a curious and sanctimonious statement given the overall miniscule presence of WR and given his own clerical provenance. Fr Michael has progressed his aspiration about establishing a hermitage. Nothing on the ground but he has created yet another website. To support one another in prayer. To pray for the life and work of the Saint Bride Hermitage. To study and celebrate the ancient forms of worship used in the British Isles and Western Europe. To make known the lives of our Orthodox saints pre and post-schism. To organise pilgrimages to the sacred sites of our native lands and to encourage Christians to undertake the care of their local holy places where possible. To adhere to a simple common Rule of Prayer. To organise local groups for prayer and study where possible. To have an annual retreat at Iona or some other holy place in the British Isles. Membership is free and members will have access to The Fellowship Journal (published three times a year on the website via a members’ area password, first issue January 2015). I'm not sure how Margaret, his former novice, acquired her title of "Sister". Self bestowed perhaps? Same old material, making much of inconsequential milestones and omitting any reference to his reversals including his suspension and forced retirement. 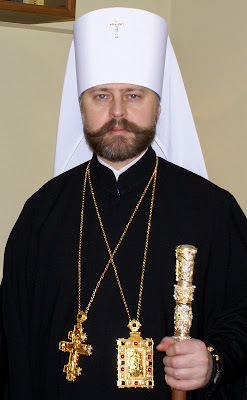 Certainly possible leverage using Metropolitan Hilarion's name and photo. The previous day he announced that M. Hilarion had "ordained" Aristibule Adams (SPM's) former "attack dog" to Sub Deacon. Hmm. I was intrigued about his fb posting yesterday. Rick Casey Name of chapel and location? Clement Consoláta Dei Why is it out of use father?" No answer yet from MW; but its certainly not Southbourne! It's actually Bournemouth East cemetery chapel near Pokesdown in the south of England. I'm surprised that MW would get this one wrong because he lived in Bournemouth for a while and used the cemetery chapel several times. And to say it was "their first chapel" is really stretching things. b) it is 456 miles away from Edinburgh. An 8 hour trip. For a period of about 14 years MW was an active and divisive figure in the Orthodox community, particularly the Orthodox cyber community through his activities on numerous discussion groups. Just to recap, MW was born in and grew up in Australia. He lived in the USA for various periods in the 1980's and early 1990's. He made his debut as a clergyman in Australia in 1992 after having been ordained into the Anglican Rite Jurisdiction of the Americas. He claimed the title of “Archdeacon of Lambeth” in 1994. It appears that this “Anglican Rite” ordination was regarded as unsound and unacceptable by his contempories he was never formally listed in government marriage celebrant records. Sometime during the 1990's he approached the Traditional Anglican Communion of Australia seeking, without success, to be ordained into the TAC. In the mid 1990’s MW also made approaches to Archbishop Hilarion presumably with a proposal that, if given a ROCOR ordination, he would attract a huge number of of disaffected Church of England parishioners to Western-rite Orthodoxy under the auspices of ROCOR. Archbishop Hilarion must have found MW to be convincing because in 1997 he did ordain MW and entrusted him with the task of evangelising the disaffected C of E community. MW became very active, mainly with his computer keyboard, in an attempt to deliver the results he had promised. During his attempts at “evangelising the west” he created a a large number of websites many of which still exist in various stages of repair. He became an identity on many of the discussion forums. Ultimately he had a falling out, and then reconciliation, with his primary sponsor, the now Metropolitan Hilarion. To cut a long story short, in spite of exaggerated claims of success, he failed to deliver on his original proposal. It seems that his assessment of the degree and extent of disaffection was simply wrong, possible having been coloured by his own experiences. MW was himself disaffected with the C of E; partly I imagine because he himself was rejected in his early days by the C of E as a candidate for ordination. Also MW’s view was that the C of E had made too many concessions in adapting to social change. In particular he seems to have regarded the decision by the C of E to ordain women clergy with odium. Perhaps his views about the C of E was shared by its parishioners but clearly not sufficiently strongly or insufficient numbers for them to go elsewhere. It appears his favoured brand of Orthodoxy was a church and liturgy that which was in the same form as existed a thousand years ago. It appears this archaic, severe, uncompromising “sword of the lord” alternative he was offering was not generally seen as an attractive alternative. Another factor in the lack of success of the initiative was MW’s personality. There are references in the discussion groups to his “eating wasps for breakfast” and storming out of groups when he could not get his own way. Consequently it appears that he could attract people to his cause but they never stayed for long. Therefore there was never any cumulative growth in the number of his adherents. Additionally, MW was often (usually?) very vague, circumspect and evasive about his qualifications, his background and achievements. In the longer term this fog of vagueness he surrounded himself with did nothing to enhance his credibility. I found that most claims he published about his achievements were impossible to verify because they the vague inferential way they were presented. Throughout his whole career, starting with his years in the Royal Australian Air Force (as a clerical assistant) he was often able to initially impress but always managed to disappoint or otherwise fail to deliver on promises and expectations. The SPM initiative was no different. As always, in spite of creating high expectations, he failed to achieve his primary task of attracting vast numbers of disaffected Anglicans . As far the the mainstream Orthodox community is concerned MW is now irrelevant, of no significance and is forgotten. Therefore I think that the SPM evangelical initiative which started in 1997 has now ended, with MW retired. and this is the article, which has no references or attributions. I’ve only looked at a few random paragraphs. His original work? You be the judge! The Byzantines strove to create a polity entirely Christian in its principles of government and in its daily life, in fact nothing less than an attempt to apply the fullness of Christ’s Way. So they strove to create a polity entirely Christian in its principles of government and in its daily life. Byzantium in fact was nothing less than an attempt to accept and to apply the full implications of the Incarnation. This is the doctrine expounded in the great code of Byzantine law drawn up under Justinian (see the ... to the first the care of souls and to the second the control of men's bodies. Let neither authority be attacked, that the world may enjoy prosperity. were two distinct roles, the priesthood and the imperial power working in close co-operation, yet each being autonomous there was a ‘symphony’ or ‘harmony’ of the two. Byzantine education followed the ancient Greek educational system that comprised a tripartite structure but was far more widespread throughout the country The structure included the elementary school, from six to ten years, secondary school, from ten to sixteen, and higher education. "Michael Wood added 4 new photos. I was brought up in the English culture. I spent younger years in the West Country and later lived (Lancaster Gate) and worked for years in London and of even later years back in the West Country and Scotland. I have lived in America, Australia, France too." He's used these words before. I expect the reason is to make it to sound like he grew up in England, is quintessential "English". and infer that he spent some time in far flung places. In fact the obverse is true. He grew up in and spent most of his life in far flung Australia and only 16 or so of his 75 years in other countries. And. just to clarify, "West Country" means "Western Australia". This photo shows the "Royal Air Force" badge. MW "served" in the "Royal Australian Air Force". And, no, he wasn't a pilot, just a clerical assistant according to his RAAF file. Earlier this year MW spent time in hospital with a fairly serious illness and from which he has now recovered but been somewhat weakened. The MW with the ambition as an Orthodox missionary to conquer the christian world seems to have faded away. Instead he now focusses on typical retirement activities such as interacting with his 1,700 odd facebook friends (of which I am one!). For this audience he provides wide ranging commentary on diverse subjects such as aircraft, Brexit, church architecture and Islam. So where to next for MW and his evangelism? Who knows, but given his age and physical condition I think his future evangelical achievements are likely to be at most modest. I want to mention Karen Mansbridge-Wood. Before she died earlier this year she told me that she was the third wife of MW, that they were married in the early 1990's, that she had daughter by him. According to Karen there was never a divorce. We exchanged numerous emails and swapped personal impressions about MW. From this exchange of emails I was able to put together a comprehensive picture of MW activities while in the US. She confirmed that there were restrictions on MW's travel to the US and explained the underlying reasons for this. This is most interesting but I can't share the details here. Karen told me what she thought drove MW to leave the marriage and become obsessed with religion and its pageantry. I'm now very clear about this now but can't share the detail. She did say "Irena had a lucky escape".... MW will know what that means. I liked Karen, I think she got a raw deal in life and I'll miss her. MW and his (former?) novice have now moved their hermitage/monastery from Edinburgh to Argyllshire, near Holy loch. MW, clearly in retirement mode, continues to interact with his Facebook friends sharing ephemera on a wide variety of topics. However it is clear that his missionary days are well and truly over. His discussion forum http://elyforum.yuku.com/ still exists but hasn't been updated since 2012 and is a monument to his early evangelical aspirations. The overall conclusion in the work is that while ther are 40-50 disparate WR canonical communities in North America there are only a handful of others elsewhere in the world with numerical results being modest and unlikely to result in a mass movement. Michael Wood Dahrendorf became the head of the London School of Economics after I had studied economics (I attended some of Hayek's lectures), he was considered by my generation to be a leading light."